I’ll tell you what- Leprechauns are tricky people! They tend to come around during mid March and wreak havoc upon our normal daily routine. Have you ever been tricked by a sneaky leprechaun near St. Patrick’s Day? Have they turned your room (or classroom) upside down? Did they leave their little green footprints everywhere for you to clean up? The messiness and the sneakiness of leprechauns is unpredictable. However, there are some wonderful things we can do to prevent it! You can wear green, for example. Everybody knows that, as long as you wear green on St. Patrick’s Day, you are safe from certain pranks. You could also hoard some gold around St. Patrick’s Day. But, if you don’t have any gold, your next best bet is to search for rainbows. As the old saying goes: there is gold at the end of every rainbow, and leprechauns love their gold. It’s safe to say, where there is a rainbow, there will be leprechauns at the end protecting the pot of gold (which prevents them from playing tricks on us!). Don’t see any rainbows in the sky? Create your own! Better yet, hand out creative rainbows to your friends! Today’s easy craft idea is more of a gift idea for the St. Patrick’s loving people in your life. 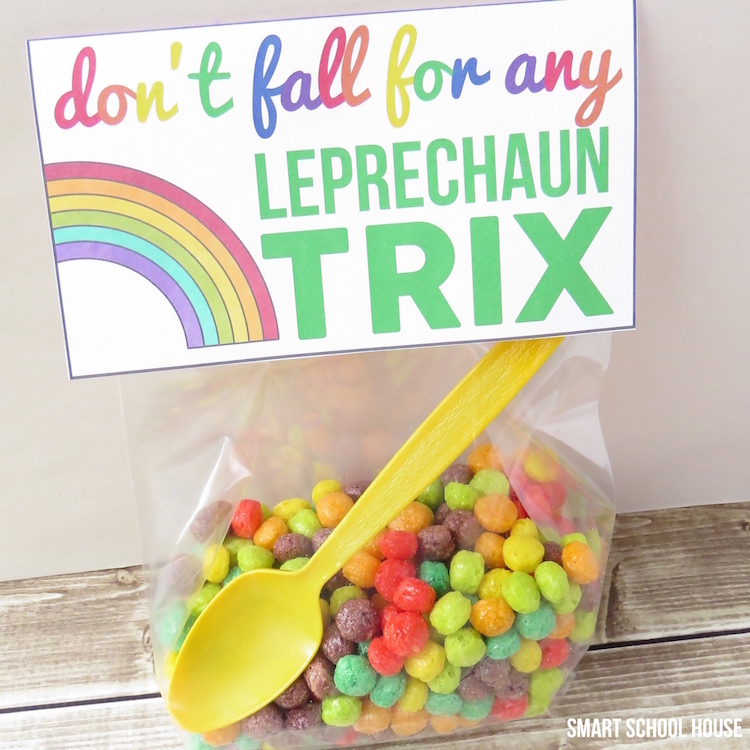 Simply fill the bottom of the goodie bag with a serving of Trix cereal and place a golden spoon inside the bag. 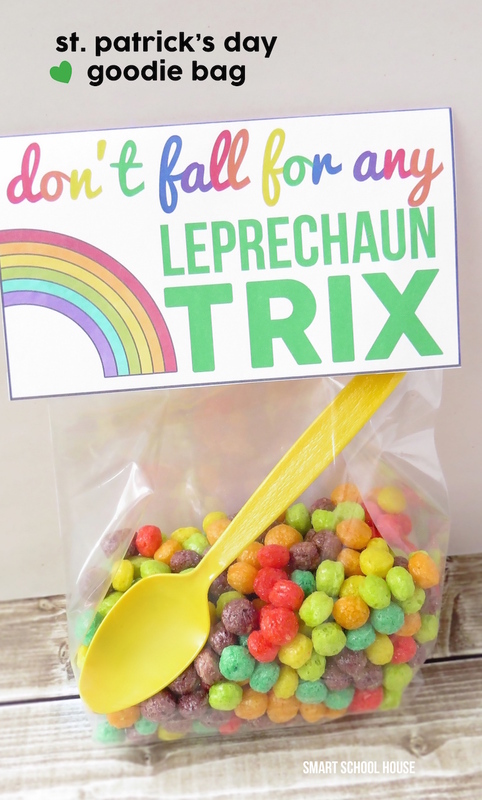 Then, cut out the leprechaun trix goodie bag topper, fold it in half over the top of the goodie bag, and either tape or staple the cellophane bag closed. That’s all! What a fun and creative way to celebrate St. Patrick’s Day! 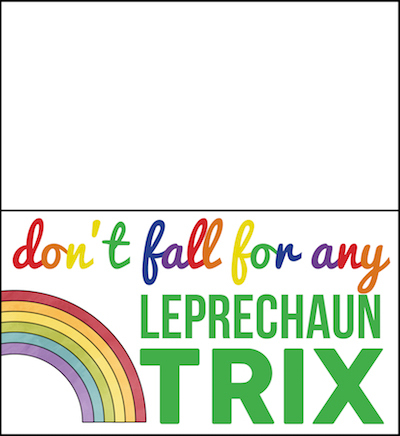 Enjoy… and stay away from tricky leprechauns! Thanks so much for this! I just wrote a short blog post on my blog about these tags. My Students loved them!